Chris Leighfield a man who walked tall throughout his entire life. an inspiration to us all. Sprite to Vibsa's With Determination. I first met Chris in the early sixties when we were doing National trials on a weekly basis. Chris was already up front with the top solo Guy’s by then. I was now a permanent passenger in Dan Shorey’s Ariel outfit. 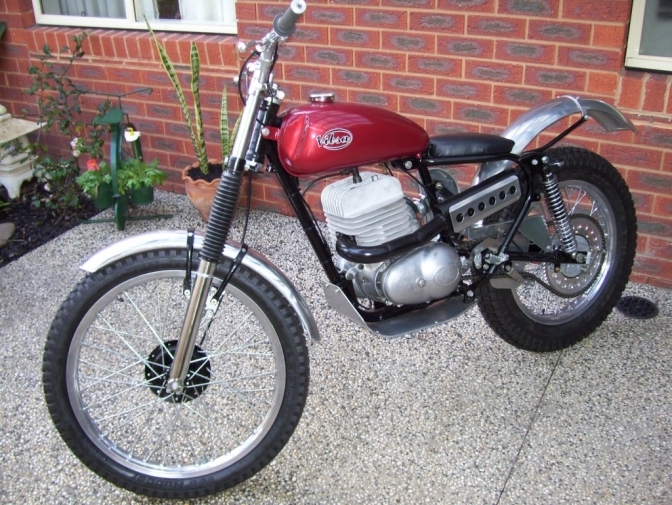 Then in 1963 I got the first TR 20 Triumph Cub out of the factory with side points fitted. Chris also had a one of the first of this batch. We were both to some extent looked after by the factory, with parts and upgrades. I then met Chris quite regularly at North Bar Garage, where him, and usually is father came to pick up the parts that he needed from the factory. It was more convenient doing this as the bits could be picked up in the evening after work, Dan or father Bert used to go to the factory every week to pick up Triumph spares so the system worked well. 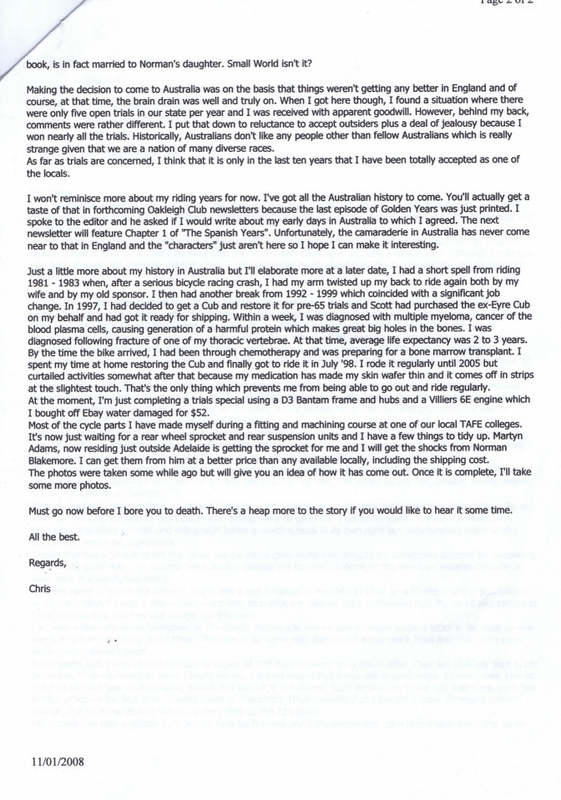 I then lost touch with Chris when he emigrated to Australia in 1972. 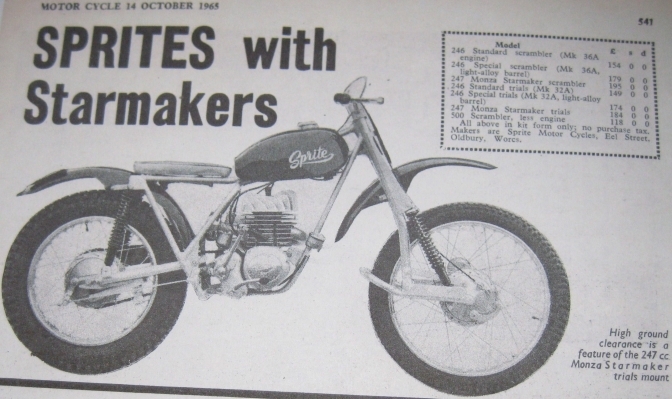 Then several years ago I was doing some research I think on Sprite trials bikes, and came across this publication in a Club trials Magazine named “The Golden Years.” Written by Chris Leighfield. I have got to get back in touch with him I thought, so emailed the club sectary and asked for his email address. It worked and I got back in touch with Chris and we mailed each other three or four times a week regularly, it was then that I learnt about his long battle with cancer. Most would just give up, not Chris; he just got on doing what he did best kept his brain working and treating life as normal as it could be. He had a weekly college course so that he could do the machining he needed for the bike he was restoring or building. And being the perfectionist he was, every little detail had to be right. Summing up the guy was Tall in stature tall in life and with determination the same. 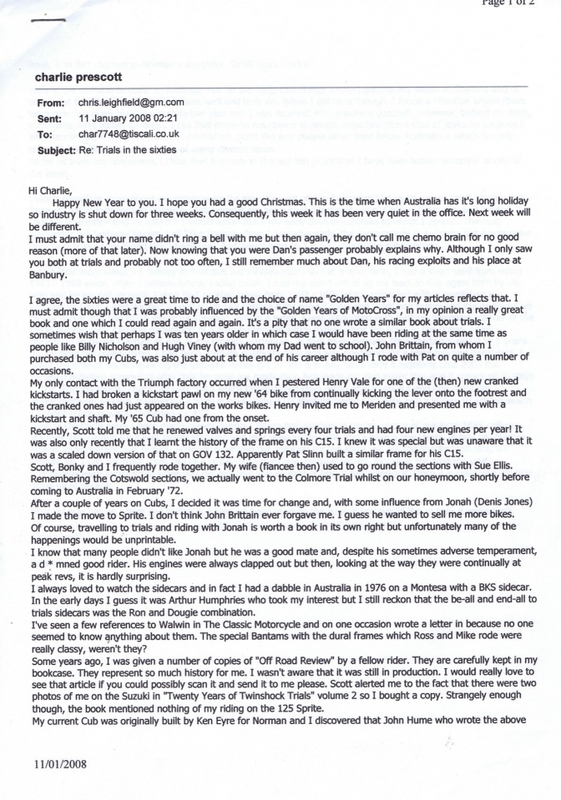 e-mails from Chris in 2008. there are more. but here is a start. ,What a bloke!.. 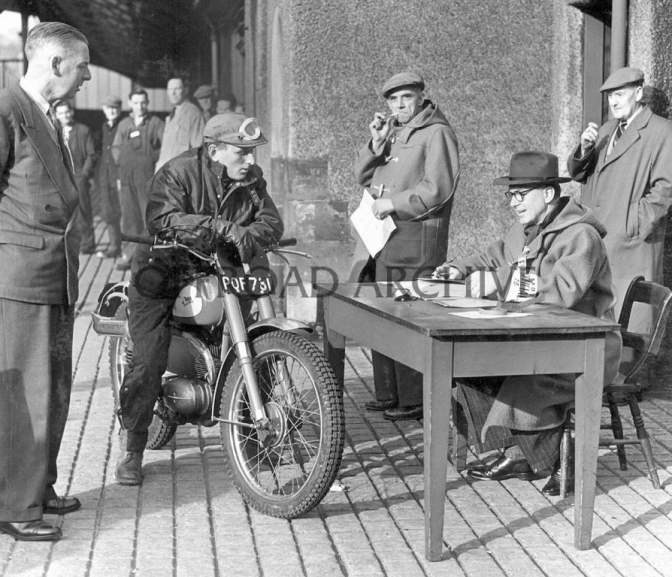 He said to me that the inspiration for the Vibsa bikes was an image of John Draper sat on his little Bantam at the start of the 1956 Scottish Six Day trial, He asked if I knew where he could find this picture. I let him down, as I did not know, It is not until I made contact with Deryk Wylde. That I now have this picture to use. Photo Offroadarchive. With Deryks Permission. I bet Chris is up there saying Yesss, that is the one. Ok here are the pictures of the Vibsa’s for a start. I will build on this page with the Sprite build and more information later. I will leave Roger Now owner of Vibsa Number One,with his tribute to the Guy. I knew Chris when he first started riding in Trials with the Castle Bromwich Motor Club when we were both 14 in the early 60's. We used to have events at the old brickworks at Kingsbury when we were both 14 and too young to ride on the road. Chris moved on to the Birmingham MCC and I rode for Solihull MCC until we started Sutton Town MCC but we remained good friends and competitors over the years while he gained support with Sprites and Cubs. Chris's bike preparation was always top notch and you could guarantee his bike would be immaculate at the start of the second day in a two-day event. Chris emigrated to Australia in 1972 and was Aussie Open champion three years running in the early 70's. Like the rest of us when we get a bit older he turned to Classics and won the Aussie Classic title 7 years on the trot. I caught up with him again when I emigrated in 1980 and found that I still couldn't beat him. As Charlie said, he built three Villiers engined, Bantam framed Vibsa's which were all superb in appearance and I bought the first one which I called V1. We had some teething problems with it, which Chris insisted on getting right and he persevered until everything was fixed which was typical of Chris. He generously responded to all technical queries from many guys over here and nothing was too much trouble for him to try and sort out. Chris finished his working life at car maker General Motors Holden in Melbourne as a power plant (engine) engineer a couple of years ago to continue his battle with his cancer. I was speaking to him only a day or so before his passing, and he was still telling me things about bikes. Charlie,> Thanks Roger for that. This is the bike that Roger bought from Chris, I now have all of the notes that Chris made while trying to get the bike right, Clutch slip ,Kickstart etc. This is a better size picture of Vibsa "One". I now have located all the images that Chris sent to me, and have all the mails about the builds but you will have to be patient , while I transfer the material from my old computers. I am still doing this very slowly but I will get there for you. Thing is with these machines being built in Australia, all the parts are really difficult to get. I have tales that Chris told me about actually making sprockets from scratch on a college notching machine with dividing head fitted. and making machines to make parts. This how dedicated to what he was trying to achieve he was. Here are a couple of photos of how "Vibsa Two" started off. And the Chopped down Chopper forks. they will be up shortly, now I am back working on this page. This is Geoff Lewis owner of "Vibsa Number two". Chris fitted the engine he had built for Geoff into this frame , this then left him with the engine for ,"Vibsa Number Three". Chris felt just well enough to set his sites to build the last bike, and finished it just before Christmas 2010.
was unfortunately the last of the bikes built by Chris. We will then start on the "Sprite" story. and the tales he told me about riding with "Jonah". Also the story of the Sprite he built from a box of rusty parts. Here is the box of Sprite Villiers bits.when Chris started the build up of the Sprite. And here is the "Sprite" when Chris had finished using his Magic on it. The late Frank Hipkin. Mailed Chris to say how good a job he had done rebuilding the bike. Sprite test rider Dennis "Jonah" Jones. 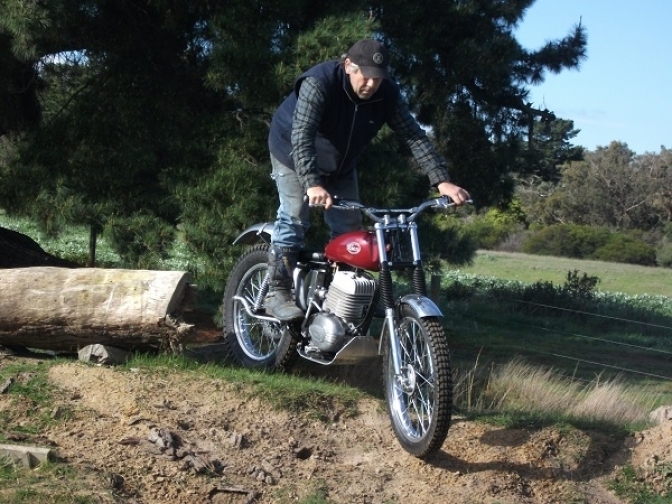 "Jonah" riding his 1966 Sprite. OK this next bit is going to be a jumble until I have sorted it. And I have so much more, but find it difficult to read sometimes. Piecing together what information I have found, and talking to people with knowledge of the Midlands Trials scene at the time, along with the help from the Hipkin family. This is my account of the time scale of the Villiers powered Sprites. 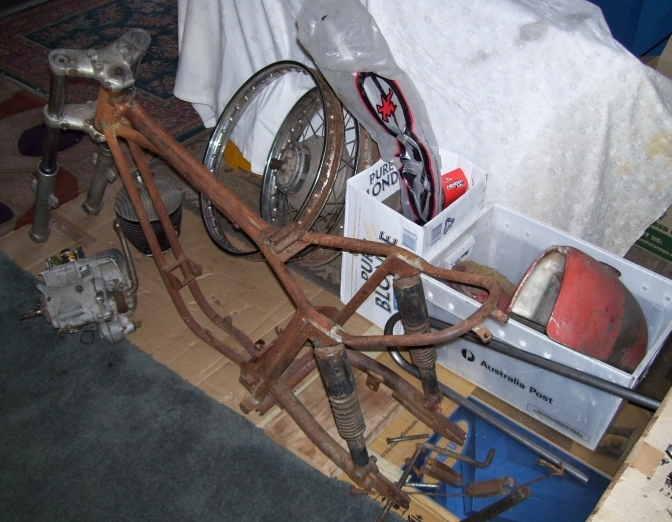 Development started to produce a Sprite trials bike. 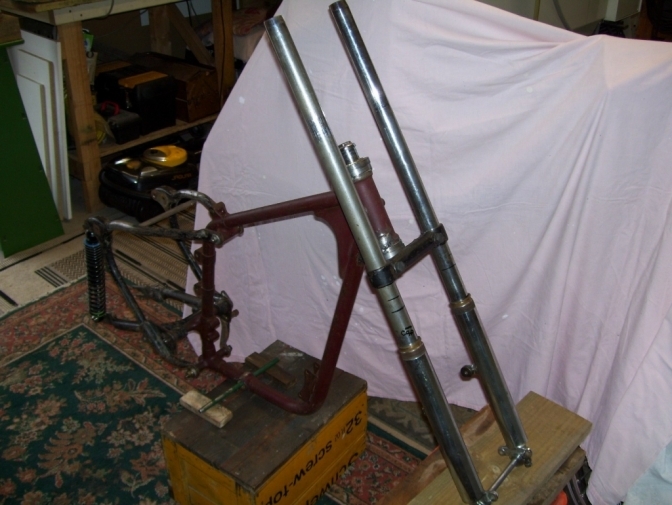 Starting point, a CoTTon frame that had the front frame loop replaced with twin small diameter tubes, to gain ground clearance. Easy with a plumbers pipe bender? Don’t forget half of the team was a plumber. Then looking at building the frame for production, ( being a plumber) it would make sense to bend the top tubes running through to the seat rails in just two lengths! The rest still looked very much like a Cotton. (This development is totally as I see it and the way I would have gone about the task)!!! 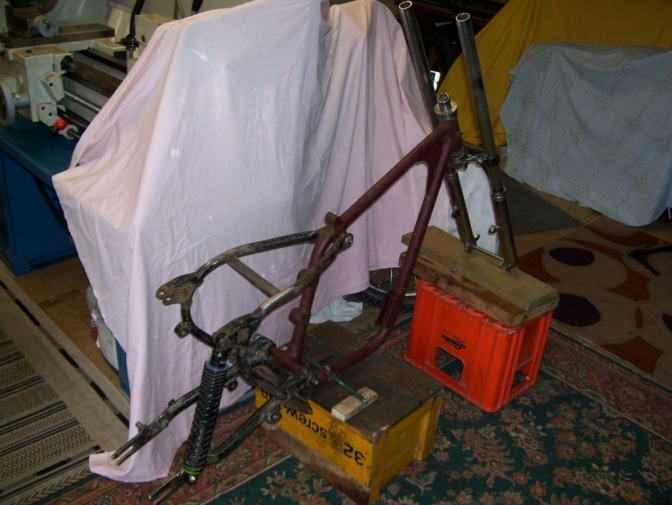 First production frames are produced; we now know that AMC forks were used on the first batch of bikes. Also that the Glass-fibre fuel tanks were very bulbous and to be honest slightly ugly? British Racing Green in colour. More development had refined some areas. In the design, ground clearance was slightly higher. During this period the new Monza Starmaker engined bike was being developed. This appeared in the press in October. The bike had 10 ½” ground clearance but still with a seat height of only 29”. The forks were of leading link type, with longer Girling units, and producing a travel movement of 7”. Nylon pivot bushes were fitted to these and to the swinging arm. Price in kit form £184, while the Standard trials, price was still kept to £149 (32A engine) only £4 more than the year before. Jonah rode in the Scottish for the first time on a Sprite. This is the year that the Sprite kits were pushed to the fore and sales coming from the novice rider, as well has the professional? Some well known names were now riding Sprite machines as well as the two development riders. I have a photo of Sam Cooper on a Sprite fitted with Bultaco forks and front wheel. The results started to come during 66 and Sprite was now a leading trials winner as well. As far as I can see this is the year when the frame was modified again, and this is the years that the two seat tubes were lost. So Sprites without these tubes are not Pre65!! Jonah would sometimes be there for 24 hours working on his bike he was allowed the run of the place and used what was necessary for him to make his bike ridable,along with fitting New tyres. He would then go off to Tipton practising taking with him a small axe has an hammer and a blunt and bent screwdriver a pair of "Mole" grips and a New set of piston rings. when he got back the tyres that he had fitted would be worn out.but left on for the week ends trials. 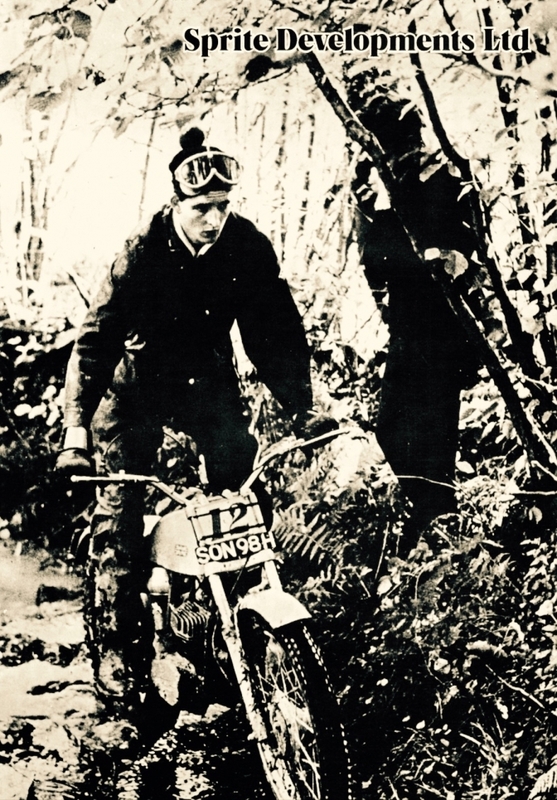 When asked why if he was riding for Sprite in 1964 why did he not ride in the Scottish Six Days Trial. 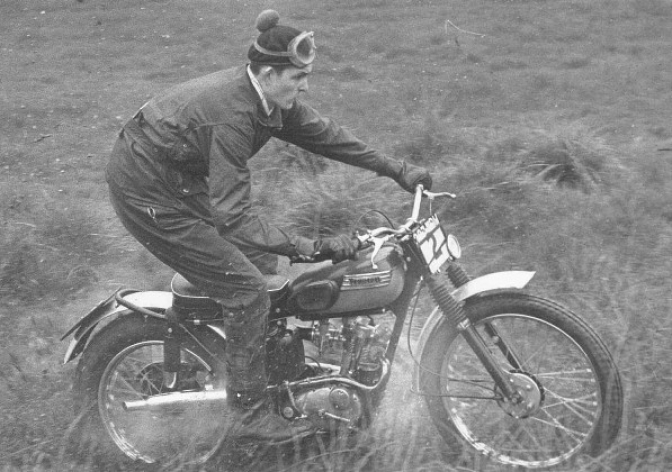 The guy only wanted to be a top flight trials rider, and all he had to ride was a beat out old Greeves with a clapped out engine. 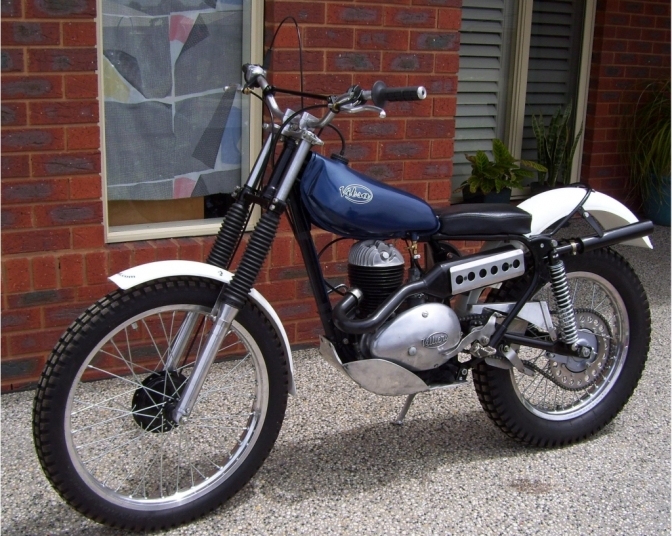 He arrived at Franks Shop on this, and asked Frank to build a trials bike around him. All Frank had was an old Cotton, so they started with that, and then set to to modify the bike to Jonahs taste and riding style. this is when I first saw the bike in oxide red with two tubes running under the engine, every time out the bike would have a different fuel tank fitted and a different colour. One weekend on one of these was placed a "Sprite" tank sticker. 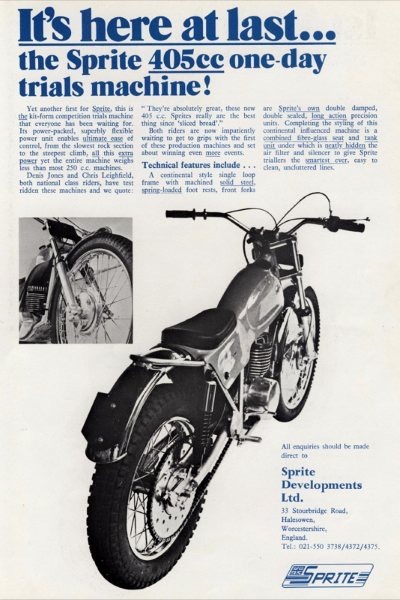 The "Sprite" trials bike was Born. 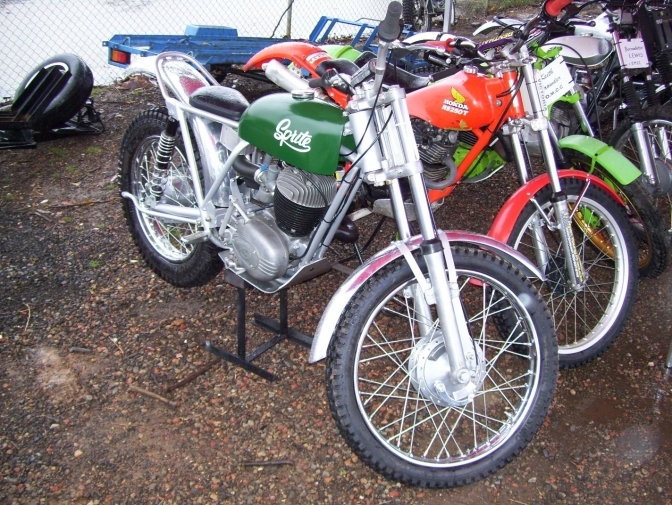 1965, and Jonah did ride in the Scottish trial, Frank supplied him with a frame, Roy Bevis lent Dennis the front forks and wheel, from his bike for the week, and Dennis fitted the engine from the Cotton into it. 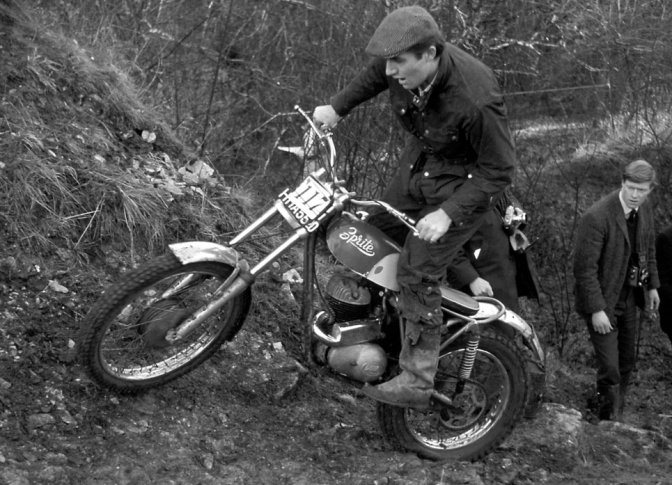 "Jonah" could only ride a trials bike in one way (spectacularly) with the throttle full open, not good for any engine, and more so not for a worn out one. He could not hold down a job, as all he wanted to do was practice his trials riding. If he had new tyres,he would wear them out practising all week for the following weekends trial, and then ride with these worn out tyres, and give the performance of the day. If you think you could ride on a shoestring budget and compete in national trials to this level, Jonah went one step further. The guy turned up at the Scottish wearing his Barbour suit, and when asked for his luggage he said he had none!! Only a pair of trainers in his pockets,and he never did wear gloves what ever the weather or condition. He did the European Championship and stayed over for the week with only £6 in his pocket. Chris used to travel with him to trials, and said he was the best mate that he had ever had, but the escapades the two got up too was unprintable, and sadly now we shall never know. One thing I can say is that "Jonah" was good at darts, but could never add up his own score and always seemed to get a bigger total than he actually scored, A bit the same as some of his trials results. The guy was a "one off Star"at the time, and only did what he did with the help of the likes of Frank Hipkin and the rest of the Midlands trials community. 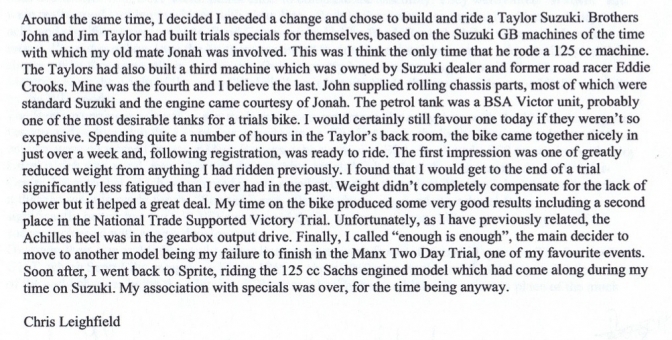 And don't forget that this was the guy who did most of the test riding on Sprite trials bikes, and if they could stand up to "Jonah" they could stand up to anyone.
" So that Podged-em then" he would reply. Last time I spoke to "Jonah" he was still living and working in Barcelona where he had a removal shipping company moving "Brits" over there from the Midlands for a new life. If you read this "Jonah" give me a shout OK. I know that you are back in the UK at the moment, 01/03/2018. Some of the "Sprite" advertising literature Frank sent to me at the time. Frank could not say enough about Chris Leighfield and his professionalism in giving the guy's at "Sprite" feedback from his rides and stating what needed to be done to each machine he rode to help produce the best from it.